Rosemary always inspires me to create. I knew I had to participate, since Kraft & Black is one of my favorite combinations. AND, I love the look of Wet Embossing on cardstock. Today, I've created a "Tag-Card" for the Challenge. Martha, this is stunning and I too like the color combo! Very stylish, but elegant too! Have a great week. Martha, this is gorgeous! Love the combination of kraft and black! This is just gorgeous. I love what you did with that stamp, and am pinning it because I just realized that I bought it a while ago and forgot to use it. Love your idea of a card/tag, too. This is so elegant and love your approach on the colour theme, Martha! Beautiful tag Martha! Love all the details you've put into it! I was just admiring Rosemary's card & now I see this one--fabulous work, Martha! I see why you won over at DD...this is Wonderful!!!!!! 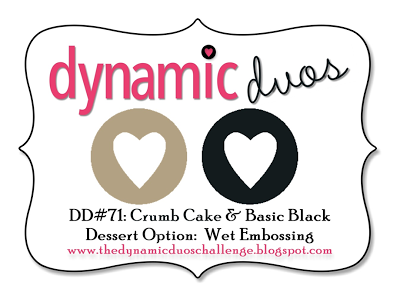 congrats on your win on Dynamic Duos - I didn't connect you with HA group - sorry - your tag is wonderful and I'm so pleased a HA discussion group member was THE WINNER!!! I should have mentioned that in the discussion group. Spectacular! And I love the button trim!